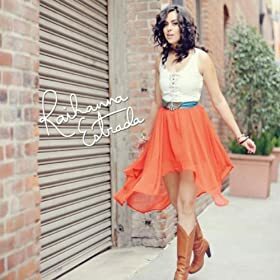 Raihanna Estrada is an American country singer-songwriter. Originally from Napa and Fremont California, Raihanna moved to Los Angeles in 2009. She released her debut self-titled EP in September last year to rave reviews. As well as writing her own songs she also has a large following for her Youtube covers. I've listened to a lot of them and I'm very impressed. My favourite cover of hers is probably the cover of Faith Hill's Fireflies. I'd love to see Raihanna record an album of some of her Youtube covers, they certainly show an accomplished artist. Raihanna also has a lot of good songs in her own material. She released four songs on her self-titled EP - Left With Nothin', American Land, Fire With Fire and Tell Me, my favourite of which is American Land. The instrumentalisation behind the song has a great pace to it without being overbearing and the song builds and fades throughout very successfully. In contrast, my least favourite song is Fire With Fire. Having heard Raihanna's Youtube covers and the other songs on her EP I find Fire With Fire to be over-produced. Raihanna is a very good story-teller and her voice suits softer songs such as American Land rather than hiding behind too much production. 1) You've covered a lot of country songs on your Youtube channel, which is your favourite cover? I'd say my favourite cover so far is "Over You" written by Miranda Lambert & Blake Shelton about his brother dying. Not only is she one of my idols, but that song really hits home for me because both of my parents passed away when I was 19. So I really connected with the lyrics. We've all lost someone we wish was still here today. 2) Which song do you wish you had written and why? I wish I had written the song "Cruise" by Florida Georgia Line that has been dominating the charts! It's so catchy & fun. I saw those guys perform at the ACA after party this past December in Las Vegas and I was definitely taking notes. It's genius to me when a song spreads like wildfire and you can't help but know it, love it and tell a friend! 3) You are a relatively new artist, how would you describe your music to people who haven't heard it before? I'm the California country girl! I write all of my own lyrics. I would say as an artist I'm a mix of Miranda Lambert, Jennifer Nettles (Sugarland) and Jo Dee Messina. You can find my debut EP on iTunes and hear for yourself. 4) Which artist from any genre would you like to collaborate with and why? That's a tough one! So many amazing artists I'd love to sit down and write with, or share the stage with. I'd have to go with Miranda Lambert though. She is incredible. I just really connect with her style, voice, and lyrics. I know she would be fun to share the stage with! 5) What music are you listening to at the moment? I've been listening to the new Florida Georgia Line album on repeat! Other than the obvious country artists, I also love traditional Irish music, Ernie Halter, Mumford and Sons, Vintage Trouble, and my boyfriend Eric Bickerstaffe's acoustic/fingerstyle EP "New Day" that is out on iTunes! Really great artists. Check them out! 6) Who are your influences? My influences are the artists I mentioned above. Also my parents. They were huge country music lovers. My influences for songwriting a lot of the time just come from conversations with friends, or a couple simple lines I happen to sing thinking about something that's going on in my life. You never know when something will inspire you, so I try to always have my phone recorder handy so I don't forget any great ideas. 7) What haven't you done in your career so far that you would like to? I would like to tour across the US with my band! I love being on the open road. And getting to play music and do that would be a dream come true. That's next on my to do list! Once I check that one off, I'd love to come tour the UK. 8) What's your favourite part of being a musician? My favourite part is knowing that someone loves a song I have written. That they can say "Wow, it's like she wrote that for me!" because that's how I feel with so many artists. I just want someone to have THEIR song and I love it when I see someone in the crowd really connecting. I also really enjoy the creative process. When I know I have a good song pouring out and I can't even write it down fast enough! Those are happy moments. 9) What's your least favourite part of being a musician? Nowadays, you have to do EVERYTHING yourself. You not only write and create, you also book the gigs, record your own albums, schedule rehearsals, film/record your own cover videos for YouTube, make your own flyers, stay on top of social media sites, plus practising your craft! You have to be a manager, booking agent, graphic designer, engineer AND artist today. Sometimes it's empowering knowing that you've done it all yourself. And other days it can be overwhelming and exhausting. Raihanna is a very strong singer-songwriter and I would definitely recommend checking out both her EP (available on iTunes and CD Baby) and her Youtube channel (http://www.youtube.com/user/RaihannaEstrada). I hope to see her in the UK soon!